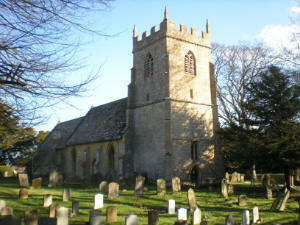 THE Parish Church of St. Eadburgha's in Ebrington, nestling in the North Cotswolds is twinned with All Saint's Hérault. The Parish Church in Ebrington stands in a commanding position in one of the highest parts of the village. It looks over a fertile vale to the hills of the Cotswold borderland. Despite being now almost encircled by trees, its short and sturdy Tower is still a landmark for miles around. ST. EADBURGHA is the patron saint. Not much is known of this Saxon saint, but what little we know is of great interest. She is patron of Pershore Abbey and, more locally, of the ‘old’ Church at Broadway and a few others in the Worcestershire / Gloucestershire area. It is known that Eadburgha was a daughter of King Edward the Elder – a son of King Alfred the Great and, at an early age, she was sent to the Abbey in Winchester founded by King Alfred’s widow. In due course she became an Abbess, and therefore a woman of great power and prestige in her day. Her relics were preserved at Pershore. St. Eadburgha’s patronal festival is held annually on the Sunday nearest to the 15th of June. Like most ancient Churches, St. Eadburgha’s in Ebrington has been altered, enlarged and restored many times. It is believed that the Tower and the south (main internal) doorway of the present building date from the 13th century. The Church consists of a chancel, a nave and three bays with a south transept aisle, south doorway porch, a blocked north door and an embattled west Tower.